THREE promising Derwent Valley footballers continue to show they have what it takes when it comes to making the big time in their chosen sport. Ryan Banks-Smith, Jack Stevenson and Josh Farrow played in the Tasmanian state team that defeated Queensland by the big margin of 43 points in Under 16s Division 2 Championship earlier this month. Played on home soil at Kingston on June 11, the match was an excellent win for the team which has shown it can match it against the bigger states. These inspiring boys all played well, with Banks-Smith being a standout kicking a goal and featuring in the best players. 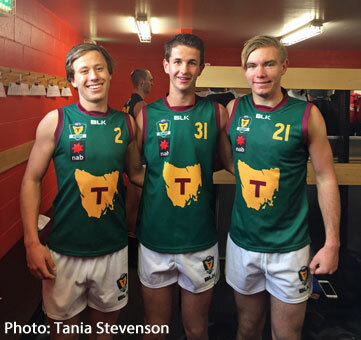 All three boys have shown they have plenty of talent and this was evident by their selection in the state squad. They came through the junior teams at New Norfolk and, as a requirement for state selection, now play with TSL club Glenorchy. The state team will now travel to the Gold Coast to play two more matches, one against the Northern Territory at Metricon Stadium at 1pm July 5 and one against NSW/ACT at Southport on July 9 at 10am. All three boys have again been selected for the team.